I have been in such a weird mood lately. Monday was such a Monday and I felt lethargic and just overall ugh. My mom always called these moods being out of sorts and I think that is the best way to put it. I am absolutely convinced that the fact that we had rain for two weeks straight with no sun (yep, wish I was kidding) had something to do with it. Thank goodness I didn't feel that way the whole two weeks. The sun *FINALLY* came out yesterday and if you ask me it was about time. It looks as though the weather will be staying nice, at least for the time being, so hopefully my mood will quickly revert back to its normal goofy self at least until Thanksgiving break when I have some time to recharge and forget the stress of school for a bit. In case anyone else has felt in a bit of a funk whether due to weather or school I've come up with some fun mood boosting ideas for those times when you could use a bit more enthusiasm. Going for a run or a walk is the perfect time for me to clear my hear. Something about working out always boosts my mood not to mention makes me feel more productive. This isn't something that I am usually inclined to do when I am in a weird mood but the other day it was my first instinct. Not sure if it was because I knew I was guaranteed to be alone (especially important when you're constantly surrounded by people) or because it gave me a chance to listen to music and think it was incredibly therapeutic even without a destination in mind. I always feel so much better after I shower or take a bath. There is something about hot water and getting clean that helps to reenergize and change my attitude. Whether you're hoping to be productive or not a change of scenery is so helpful. Sometimes being in the same environment for too long can leave me unmotivated and therefore in a bit of a funk. Studying else where or taking a different route then I'm used to definitely helps to perk me up. Love blogging? Reading? Singing? Whatever it is just do it. If you're doing something you love you're nearly guaranteed to have a better attitude. Nothing is better at getting your mind off of something than immersing yourself into a movie or tv show. Looking for TV shows then watch Gilmore Girls or Friends, two of my personal favorites. As a college student this is a no brainer. Most of the time a lack of sleep is the root cause of a bad attitude at least for me. Take a nap to recharge and at the same time wake up hopefully with a better mood. Music is a great way to change your mood. Head to spottily and listen to one of their pre made playlists or make your own with exactly the songs you want to hear on it. Hmmm why do you think I am blogging? Kidding, sort of. Writing out what you feel is great. No you don't necessarily need a diary but writing out what has been bothering you is a great way to help sort out what you feel and maybe even change your mood. Maybe this is the organization obsessed side of me but making plans and giving me something to look forward to is a great way to change my attitude. Whether it be dinner with a friend or a trip home either works well! I can't focus if my surroundings are messy and if they are messy then chances are I'm stressed and not in the best mood. Cleaning up my surroundings may even help to clear my mind. Paint your nails, run some errands, do whatever it takes for you to focus on yourself. Taking me time ensures that you're focused on how you feel and your emotions. I always feel more put together after painting my nails which would likely change my attitude. This is something I wish I had more time for in college. Over breaks I love to spend time reading and enjoying a good book. If you're having an off day fully immersing yourself in another character's life even if it is just for a little bit can help you rethink why you're in a funk in the first place. Frozen yogurt, chatting break in the library, go for a hike. I always love spending time with my friends and they are the best people (maybe aside from my parents) to change my mood just by conversing. 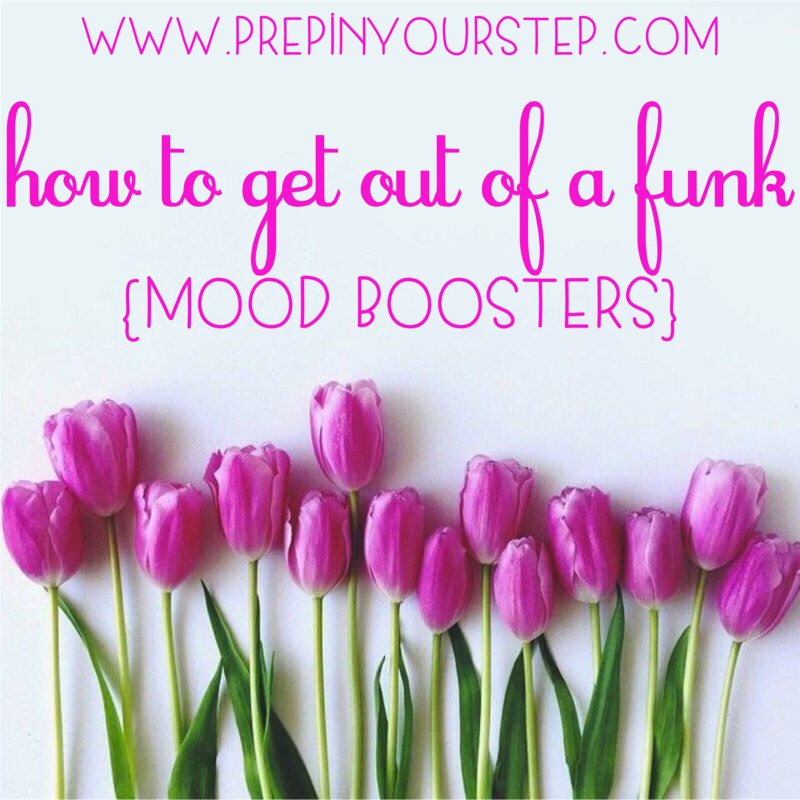 If y'all have any other ideas for ways to boost your mood definitely leave them in the comments! I'd love to hear them and hope that y'all have been having a great week so far! Love these tips Dorothy! It's been raining here non-stop until yesterday and that's definitely helped my mood!